As the first president of Hope College, Philip Phelps’s vision and dedication to the academic institution cultivated a healthy growth on campus. His accomplishments include petitioning for the charter of Hope College in 1866, championing women’s education at Hope College, and co-founding Hope Reformed Church. On July 12, 1826, Philip Phelps Jr. was born in Albany, New York to Philip Sr. and Hannah Mascroft Phelps. He was the sixth of seven children born into a well-established American family of mixed European descent. In addition to serving in the family’s Reformed Church, Philip Phelps Sr. also held the position of Comptroller of Albany for 50 years. Philip Sr. and Hannah Phelps made the education of their children a priority; neither time nor expense was spared. As a young boy, Philip Phelps Jr. was enrolled in the Albany Academy, a prestigious New York boys’ school. For nine years, he studied under master educators. The young boy excelled in the fields of mathematics and classical languages. He graduated with honors. In 1842, at age 16, Phelps enrolled in Union College as a member of the junior class. His passion for learning, which his parents had instilled in him, fostered Phelps’s desire to become an educator. Upon graduating Phi Beta Kappa from Union College in 1844, Phelps received his Bachelor of Arts degree. He remained in New York to teach school. After two years of teaching, Phelps chose to transfer his skills as an educator to the pulpit. He relocated to New Jersey and enrolled in the New Brunswick Theological Seminary. While in Seminary, Phelps contemplated his vocation. The missionary field appealed to him. Instead of remaining in the Eastern United States, he informed his father that he would like to serve the Reformed Church in Borneo of Amoy, China. His father, however, disapproved of the notion. Philip Phelps Jr. honored his father’s wishes, choosing a wife and familial proximity over a career as a missionary. In 1849, Phelps graduated and was ordained by the Dutch Reformed Church in America. He accepted his first pastoral position at Greenburg Church in Westchester County, New York shortly after completing New Brunswick Theological Seminary. Two years later, in 1852, Phelps established First Reformed Church in the New York village of Hastings-on-the-Hudson. He served the community as a “missionary pastor.” The first service was held in the home of a congregation member. Phelps not only preached, but also led the singing. Within two months, Phelps received an official appointment as the First Reformed Church’s pastor and a house of worship was constructed. During his nine years in Hastings-on-the-Harbor, Phelps was married and began a family. In 1853, he married Margaret Anna Jordan. 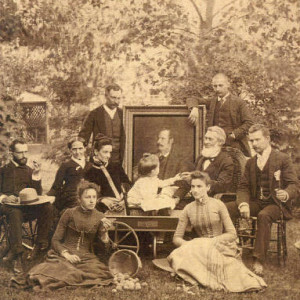 The couple had five children: Frances Phelps Otte, Philip Tertius Phelps, Elizabeth Phelps, Edward Phelps, and Theo Phelps. Frances, Philip, Elizabeth, and Theo survived to adulthood. While serving the Dutch Reformed Church in America, Phelps developed relationships with prominent Dutch-American families and recent Dutch immigrants, including Reverend Albertus C. Van Raalte. 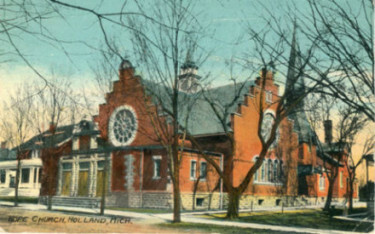 the founder of Holland visited First Reformed Church in Hastings-on-the-Harbor during one of his many fundraising trip. Phelps and his family opened their home to Van Raalte. Following Van Raalte’s stay, the two ministers remained in contact through correspondence. 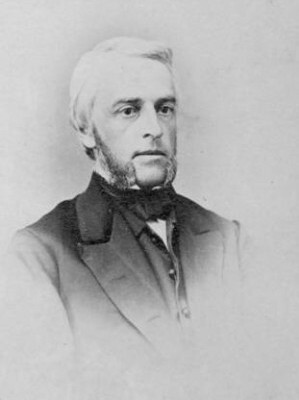 In 1859, the principal of the Holland Academy, John Van Vleck, fell ill. Van Vleck was the institution’s third principal. Like his predecessors, he was originally from the Eastern United States. These men could neither adjust to the wilderness nor bear the demands of the job. Van Vleck resigned from the position and returned to the Eastern United States, as had the two principals before him. Phelps accepted Van Raalte’s offer. At age 33, he resigned from the First Reformed Church of Hastings-on-the-harbor and relocated his family to Holland. In addition to his position at the Holland Academy, Phelps was also named “missionary pastor” to Holland’s English speaking population. Accepting the position required Phelps and his family to exchange the comforts of their upper class life in New York for a life of uncertainty in Michigan’s rugged wilderness. The upper class New York family was accustomed to the company of highly educated, well mannered, and fashionably dressed Americans. Holland’s Dutch immigrant population was comprised of common people, kleine luyden. They lived as pioneers on the Michigan frontier and exclusively spoke Dutch. Margaret Anna Phelps was the only family member fluent in Dutch. Phelps willingly traded his comfortable life in New York in order to answer the call God had placed upon his heart. “I felt in my heart that I was called of God to the work,” the young minister stated, “and under that conviction I went, whether to failure or success I did not know.” Philip, Margaret, and their daughter Frances Phelps traveled to Holland in 1859 by rail and coach. Following their journey, Phelps and his family arrived at a five-acre academic campus with one central building and a learning environment described as “chaotic.” Phelps immediately set out to expand the campus and develop a systematic educational system. His vision for the Holland Academy was to transform the school into an institution of higher learning. Under Phelps’s leadership, the campus expanded from five-acres to 16-acres and the number of buildings significantly increased. Constructed in 1858, Van Vleck Hall was the Holland Academy’s first building. It functioned as a multi-purpose space. The hall not only provided living quarters for the principal’s family, but also served as a lodging house for students. Chapel services, classes, and social activities were all held in Van Vleck Hall. Phelps recognized that Holland Academy must construct additional buildings in order for the student body to increase. After obtaining funding and building materials in 1862, faculty and students constructed five new buildings including a chapel, dormitory, and gymnasium. The new structures were functional, not ornate, and enabled the Academy to grow. As principal of the Holland Academy, Phelps set out to enrich his students’ educational experiences through the reformation of the institution’s “chaotic” learning environment. Prior to his arrival, faculty members had neither assessed their students’ academic abilities nor divided the boys into classes. Instead one to two teachers managed a room, assisting students of varying ability with a variety of disciplines. In an effort to improve the classroom environments, Phelps systematically assessed the 32 students and placed them into appropriate classes. The goal of the Holland Academy was to prepare male students to attend New Brunswick Theological Seminary. In 1860, however, few, if any, of the students were performing at a college level. Within three years of Phelps’s arrival, his structured educational program was yielding successful results. In 1862, ten young men had advanced to college level coursework. As the students’ abilities increased, the principal worked to elevate the Academy into an institution of higher education. He increased the faculty size to six professors and taught classes when the need arose. When the Holland Academy was established in 1851, its mission was to prepare male students to attend New Brunswick Theological Seminary. In 1860, however, few, if any, of the students were performing at a college level. Within three years of Phelps’s arrival, his structured educational program was yielding successful results. In 1862, ten young men had advanced to college level coursework. As the students’ abilities increased, the principal worked to elevate the Academy into an institution of higher education. He increased the faculty size to six professors and taught classes when the need arose. Phelps’s also envisioned a different mission for the Academy. Like Van Raalte, he wished to develop the school into an accredited college and theological seminary. The principal also proposed that the college should prepare its students for careers both inside and outside of the Church. His vision for the Holland Academy, as well as his dedication, propelled the institution forward. 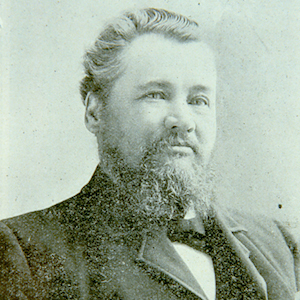 Phelps was also called to Holland to serve as a missionary pastor to the community’s English speaking population. Originally, the city’s Dutch Reformed Churches only held services in the colony’s primary vernacular. In 1862, Phelps and members of the English speaking community established Hope Reformed Church. From 1862 to 1866, Phelps served as minister of Hope Reformed Church. In October 1871, the Great Holland Fire destroyed Hope Reformed Church. Three years later, in 1874, an orange brick Gothic Revival church was erected. Hope Reformed Church’s new edifice was designed by New York architect Carl Pfeiffer and built by local contractor James Huntley. Oh, ne’er cut loose the anchor, boys! The anchor sure, of hope! The event was a time of celebration for the students, faculty, and Holland community. Phelps’s presidency was characterized by his small gestures of kindness towards students and his grand ideas for the institution. He was a progressive individual who wished to continuously expand and propel Hope College forward. During his tenure, he opened enrollment to foreign exchange students and women. While the General Synod of the Reformed Church in America tolerated these actions, Phelps’s designs to turn Hope College into “Hope Haven University” fractured his relationship with the school’s governing body. Phelps was dedicated to investing in the academic and spiritual lives of Hope College students, a tradition that Hope College administrators, faculty, and staff continue to uphold. 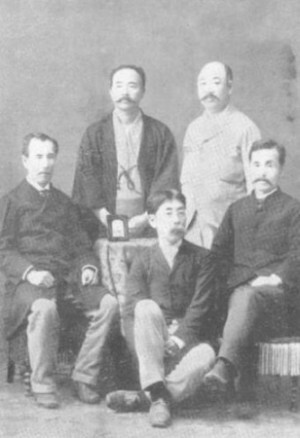 In 1869, Phelps welcomed five Japanese men onto Hope College’s campus. The students had arrived in Holland to study and live at the city’s newly chartered school. The men resided in Van Vleck Hall, which had remained the Phelps family’s home. After completing their coursework, the men returned to Japan and pursued a variety of careers. When the Hope College Alumni learned about Phelps’s death in 1908, the men held a memorial service for in honor of the school’s first president. In 1878, under the leadership of Phelps, Hope College opened admissions to women. The first female class consisted of two students, President Phelps’s eldest child, Frances Phelps, and Sarah Gertrude Alcott. The first class of young women graduated in 1882. By 1881, over 110 women had enrolled in Hope College. President Phelps’s youngest daughter, Elizabeth Phelps, was also a Hope College alumna. 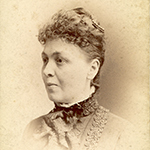 Elizabeth Phelps graduated in 1884 with classmate Mary Alcott Diekema. The OKE Fraternal Society originated at Phelps’s Alma Mater, Union College. During his tenure at Hope College, Phelps established a chapter of the once secret society at the institution. Members of the Fraternal Society were provided with opportunities to socialize, as well as develop their skills as writers and rhetoricians. Over the course of Phelps’s career in Holland, he crafted the Holland Academy into an accredited college complete with an affiliated theological seminary. The president, intent on expanding the institution, devised a plan to turn Hope College into “Hope Haven University.” His plan to add graduate courses in the sciences was divisive. While faculty members held conflicting opinions as to the future direction of Hope College, they recognized that the school lacked the financial resources to develop graduate school programs. Phelps, however, continued to push his agenda. In 1878, the General Synod of the Reformed Church in America, Hope College’s governing body, sought to end the mounting discord with a resolution. After 19 years of service, Phelps was asked to resign from Hope College. Although Phelps was removed from his position at the college, he and his family remained residents of Van Vleck Hall out of protest. The former president asserted that the “dismissal was absolutely and forever incapable of defense from any legal, moral or ecclesiastical point of view.” At the time of his resignation, the Phelps children were still enrolled in Hope College. Furthermore, the General Synod owed him back salary and had failed. Phelps was also awaiting the repayment of loans he had issued to the General Synod. 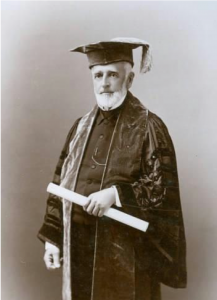 When the last Phelps children, Elizabeth and Theo Phelps, graduated from Hope in 1884, the former president and his family still inhabited Van Vleck Hall. His refusal to move had displaced the school’s second president, Charles Scott. In 1884, the General Synod finally issued an order demanding the relocation of the Phelps family. Phelps complied, vacated the premises, and returned with his family to the state of New York. Upon returning to his home state, Phelps accepted a pastoral position at two churches in the neighboring villages of North Blenheim and Breakabeen, New York. He served these communities for nearly a decade before retiring from the pulpit at age 65. In 1891, Hope College celebrated its quarter-centennial. Phelps was invited to return to the school he helped establish and had faithfully served for 19 years. On the campus he had once called home, faculty, students, and community members recognized Phelps for his role in the formation of Hope College. 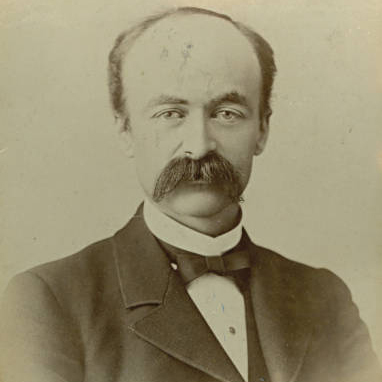 He returned again in 1893 to speak at the inauguration of President Gerrit J. Kollen. On September 4, 1896, Hope College’s first president passed away. Phelps died in his eldest son’s New York home at age 67. Philip Phelps was a talented scholar, a gifted reverend, and a dedicated educator. He was an idealist who succeeded in advancing the mission of an institution he fervently supported. Phelps steered the Holland Academy and Hope College through momentous events. In 1866, he petitioned the State of Michigan for the charter of Hope College. Nearly a decade later, he welcomed women onto campus and into the classroom. Phelps established a tradition of excellence. He was an educator and a mentor who cared deeply about his students’ academic and spiritual lives—a trait that Hope College administrators, faculty, and staff have continued to emulate for 150 years. His legacy, while tarnished near the end of his tenure, has since been fully restored. In 1960, Hope College erected a new dormitory at the intersection of Columbia Avenue and Tenth Street. In honor of Hope College’s first president, the building was named Phelps Hall. Bruins, Elton J., and Karen Schakel, eds. Envisioning Hope College: letters written by Albertus C. Van Ralte to Philip Phelps, Jr., 1857 to 1875. Holland Mich: Van Raalte Press, 2011. History of Muskegon and Ottawa Counties, Michigan: with Illustrations and Biographical Sketches of Some of its Prominent Men and Pioneers. Chicago: H.R. Page and Co, 1882. Jacobson, Jeanne M., Elton J. Bruins, and Larry J. Wagenaar. Albertus C. Van Raalte—Dutch Leader and American Patriot. Holland, Michigan: Hope College, 1996. Shears, Laura. “Philip Phelps,” August, 2008. Shields, W. N. “A Tribute to Dr. Phelps.” Anchor, 1896. Swierenga, Robert P. “Getting Political in Holland.” Holland Historical Society, Holland. April 11, 2006. Lecture. Winter, Rev. Egbert. “Dr. A.C. Van Raalte.” Anchor, 1903.